Two weeks ago the sour cherries ripened. We picked a bunch and made sour cherry lemonade. This week we made lemonade with strawberries in it. And egg custard with blueberries on top. 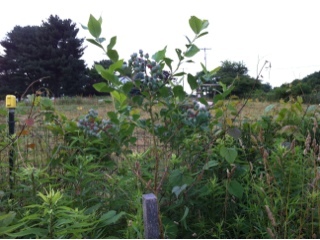 The blueberries are just starting to ripen. The plums, peaches, pears and apples look beautiful too. 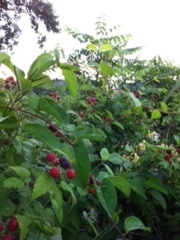 But this week, and for a couple of weeks, it will be all about the blackberries, black raspberries and red raspberries. 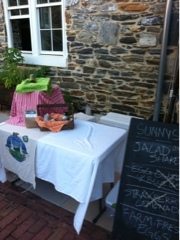 Mostly for us, maybe added to lemonade at farmers markets, we will be picking whenever we have the chance. While blueberries are available in the grocery store year round, the other berries now starting to ripen just do not transport. They really are ones that we must stand and eat within moments of picking. A job we are happy to do!